Based on actual events....the words every horror fan takes with a pinch of salt opens up this creature feature which is best described as Australias answer to 'JEEPERS CREEPERS'. A documentary camera crew is hired by a Russian to go out to the outbacks and capture on film a creature that has never been photographed before. With the promise of a big payday these four friends go out to do just that but along the way they encounter struggles within their own unit. Two of the guys fancy the female lead of the film and one of the guys is destined to die just by the way he acts towards everyone. As the search continues for the mythical creature they come across a man known simply as Simson who is your typical old creepy man who lives on his own in the middle of nowhere. From lack of food they stay at his abode until the morning and continue their quest. As night falls they seek refuge once again but the only shelter they can find is a church, which is where we get to see the creature of the film the most. 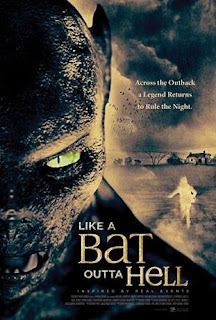 The creature they seek is a 4 foot high bat like creature with human features and razor sharp teeth and when it gets you it will rip off your face. Unfortunately for the guy who no one likes this is exactly what happens to him and fortunately for us we don't have to listen to his rubbish jokes any more. As the remaining few try to survive from the bat creatures they get split up and the hero of the team joins forces with Simson to battle this vicious enemy. Enjoyable flick from down under with an ending that will leave a bad taste in alot of people mouths. It does have a really good soundtrack which has a INXS or ICEHOUSE feel about it. The creature itself is pure cgi from hell but we shall let that pass as this is a low budget film and you don't see the creature much anyway. Well acted throughout even if there is some bits where your not sure if its supposed to be funny or not.